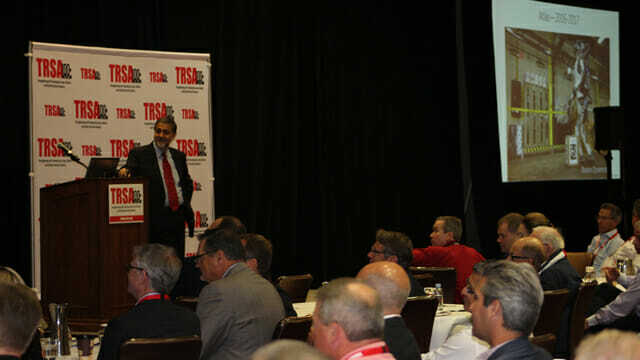 TRSA recently held its 105th Annual Conference & Exchange from Oct. 16-18 at The Meritage Resort & Spa in Napa, CA. Highlights of the event included keynote speeches by a tech expert and renowned vintner, thought-provoking panel discussions, the Annual Awards dinner and several networking events in wine country. Following a Welcome Reception on Oct. 16 to formally kick off the Annual Conference, the conference got in full swing the following day with a keynote address by Vivek Wadhwa, a technology expert and columnist for The Washington Post and Bloomberg Businessweek. Wadhwa’s speech looked at technological innovations, and how those advances are disrupting industries today and how that will continue into the future. Textile Services Bottom Line Performance, with Andrew Wittmann, CFA, senior research analyst, institutional equities and research, Robert W. Baird & Co.
A panel titled “Global Opportunities and Challenges in the Linen, Uniform and Facility Services Industry” concluded the education sessions for the day. The panel featured Enrique Jacques, COO, LAVARTEX SAPI de CV, Mexico City; Jose Luis Jacques, CEO, LAVARTEX SAPI de CV, Mexico City; and Joe Sullivan, national technical operations manager, Spotless Laundries, Melbourne, Victoria, Australia. Chris Sander, CEO, Johnson Service Group, Preston Brook, Cheshire, England, also was scheduled to appear, but was unable to make it. Instead Joseph Ricci, president and CEO, TRSA, reported on the European linen, uniform and facility services market based on a report submitted by Sander in advance of the conference. The first day concluded with several networking events, including a Pizza Challenge and Grape Stomping competition at the Peju Family Winery. Conference attendees also were treated to a wine tasting and outdoor lunch at the vineyard. The Chairman’s Reception and Annual Awards dinner wrapped up the day’s events. Thanks to TRSA’s Annual Conference Event Partners JENSEN USA and M&B Hangers, as well as the following sponsors: Brim, Ecolab, Ellis, G.A. Braun, Kannegiesser ETECH, Lavatec, Pellerin Milnor, Standard Textile and Tingue. The next TRSA Annual Conference is scheduled for Sept. 17-19, 2019, at the Hyatt Regency Boston Harbor.